A cohesive development, offering diversity, choice and quality. ‘Coast’ Papamoa Beach is a comprehensively planned new residential development located between Tauranga’s Pacific coastline and the green backdrop of the Papamoa Hills. Frasers Papamoa Limited engaged Boffa Miskell to carry out the master planning and overall landscape design for the development. This included the design of the gardens for their new show homes, the Tipene reserve and stream. Boffa Miskell worked closely with the developer to create a cohesive development, offering diversity, choice and quality to prospective Coast residents. The ‘Tropical’ show home garden is one of five new show home landscapes designed by Boffa Miskell as part of the launch stage of the Coast residential development. The design incorporates lush plantings, decks, water features and a lap pool which are all cohesively designed to create a fluid indoor- outdoor flow. Tipene Reserve is the central public recreation facility for the development. The reserve location was designed as part of the overall urban design plan and has been specifically located to provide strong connections to the private open space and a future reserve immediately adjacent. 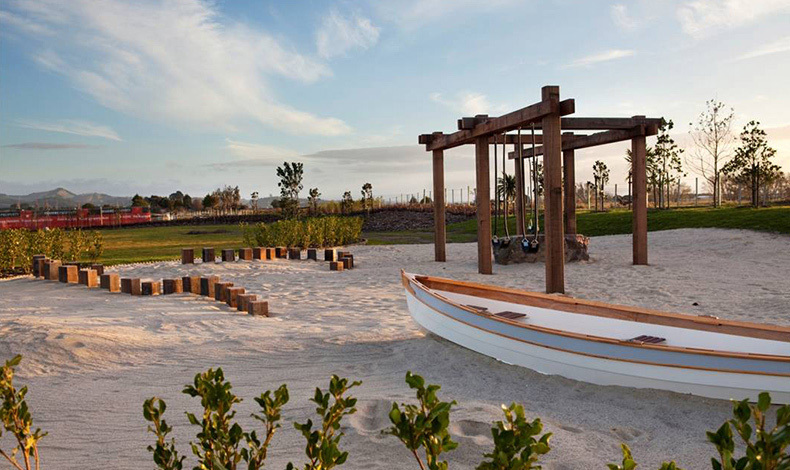 Reflecting the coastal environment was a key design factor for the playground. Use of safety fall sand is the first of its kind in Tauranga. Karri timber swings and stepping stones provide a visual connection to the reserve boardwalk and feature walls within the wider development. Two confined entry points provide for easy monitoring of children within the area with sightlines outside of the playground to the reserve and road edge. Instead of commercial furniture, custom designed products were preferred, including the large boulder, wooden boat and stepping stones. The ‘riverine’ feature is one of several water courses which will create a unifying character on alternating sides of Coast Boulevard, the spine road of the development. Due to the requirement for high water quality adjacent to the reserve playground, it was decided to design the feature as a closed system, with water circulating through a combination of natural and artificial bio-filtration media. The wetland plant species, planted in marginal planters, serve both an aesthetic and filtration function. The pond is constructed from a waterproof concrete compound which is shaped to accommodate the pump and biofiltration system. Master planning, detailed design and specification and implementation.